Britain's young adults are the biggest daredevils when on holiday, as new research highlights that they are the most likely to take part in potentially dangerous activities. 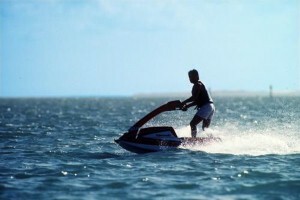 Research from moneysupermarket.com has found that 52 per cent of people in their 20s have taken part in an impulse activity such as jet-skiing or scuba diving when on holiday. This compares with 45 per cent of adults in their 30s. Also, those living in London are seen to be the most fearless with 44 per cent having taken part in an extreme sport abroad, with people in Wales proving to be the biggest wimps at 33 per cent. However, the price comparison site advises holidaymakers to make sure they are covered for such activities by their travel insurance. Peter Gerrard, head of insurance research at moneysupermarket.com, said: "Travel insurance policies will vary significantly and exclusions and caveats are commonplace. "It is important to check the small print and ensure you are covered for every eventuality. I advise Brits to think ahead about activities of interest before shopping around for the most adequate level of cover and best value policy."